The most valuable convenience you can hope for when purchasing a home abroad is the ability to load up the car and drive to it… it’s one of Mexico’s biggest advantages. Today we’re going to look at three popular spots on the Sea of Cortez, all within a day’s drive of the U.S. border: Puerto Peñasco, San Carlos, and Mazatlán. The Sea of Cortez is the body of water that separates Baja California from the Mexican mainland, and it’s also known as the Gulf of California. It starts at the mouth of the Colorado River. The sea is noted for its warm, calm, and relatively protected waters, and for being one of the most biologically diverse seas on earth. Property taxes are extremely low, even on the beach. You can expect to pay somewhere in the US$200 to US$400 range. Let’s take a look at three attractive choices just south of the border. Drive time from U.S. border: 1 hour 10 minutes, 62 miles (100 kms). No direct flights to the United States or Canada. Puerto Peñasco enjoys miles of wide, sandy beaches bordered by the warm waters of the Sea of Cortez… waters that are warm, clear, and calm all year long. The grade going into the water is gentle, making it perfect for small children. For sun lovers, Puerto Peñasco sees 362 days per year of brilliant sunshine… which is about as close to always as you can get. This is no surprise, since the town is on the edge of the Altar Desert… one of the driest and hottest in the Americas. And if you’re a boater, you’ll appreciate the large, sheltered marina, which hosts both commercial and pleasure craft. Best of all, beachfront homes here are a real bargain. 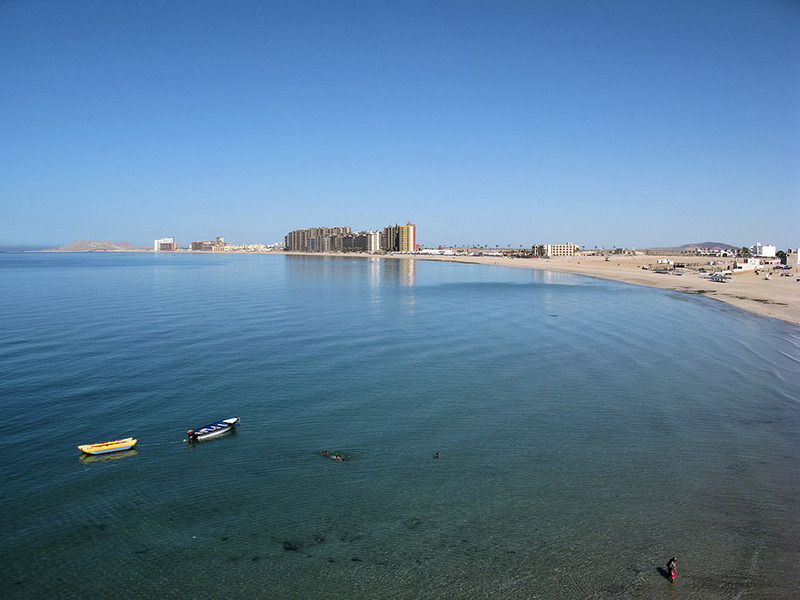 This popular destination is known as Puerto Peñasco in Spanish, and Rocky Point in English. Surprisingly, it had its English name first, named so in 1826 by a retired Royal Navy admiral who was in the area scouting for precious metals. The Mexican president renamed the town in the 1930s. Any discussion of Puerto Peñasco has to start with the fact that it’s only 62 miles (100 kms) from the U.S. border, a drive that takes about 1 hour and 10 minutes. It’s just over three and a half hours by car from Phoenix, and six hours from San Diego. Properties in Puerto Peñasco can be quite a bargain, even on the beachfront. I always look for good deals at a development called Las Gaviotas because it’s on the beach, it’s within walking distance to downtown, and the prices are low. Units here rent for about US$125 daily, or US$1,200 per month. You’ll often see listings from US$110,000 to US$150,000. As of today, a walk-out-onto-the-sand townhouse will run you US$204,000, beachfront condos start at about US$149k in good areas, and an ocean view home (three blocks in from the beach) will set you back US$109k. Luxury properties in high-end developments can easily exceed US$500k. Puerto Peñasco does not have an attractive historic center, so there are better places to enjoy a downtown lifestyle near the sea. The seafront restaurant district is fairly touristy, so it’s hard to enjoy the malecón (seafront promenade) without the annoyances of vendors and tour guides looking for your business. There are no big cities nearby, for the practical items that big cities offer. Your best bet for a real city is probably Tucson, Arizona. Puerto Peñasco is just over an hour from Arizona. And after crossing at Lukeville, Arizona, I didn’t stop for any customs or immigration checks. Also, no vehicle permit is required this close to the border. Puerto Peñasco has a large expat community, and you’ll have plenty of neighbors from Arizona or California. U.S. dollars are accepted almost everywhere, except at the gas station. You’ll get a better deal spending pesos, but it’s nice to know you can use dollars in a pinch. Drive time from U.S. border: 5 hours and 15 minutes, 261 miles (421 kms). 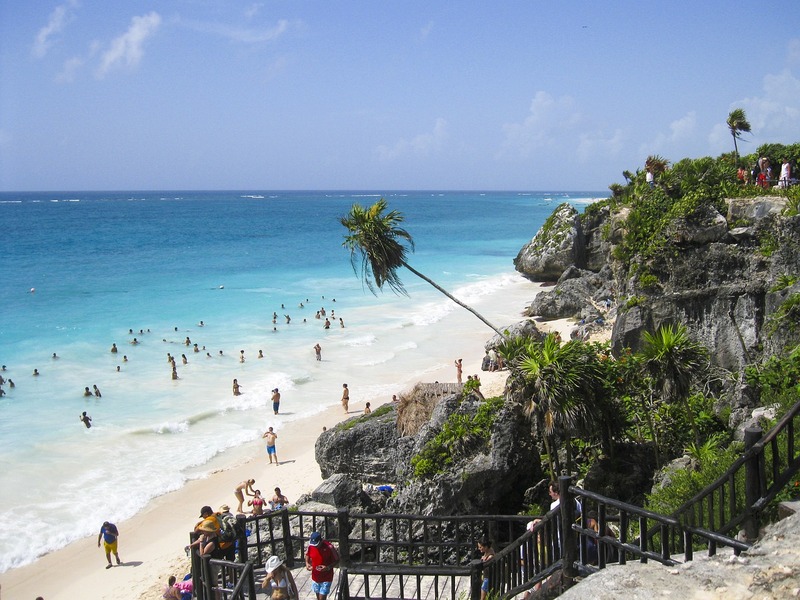 Miles of sandy beaches… clear, warm waters… excellent diving… and a large expat community. These are what come to mind when I recall San Carlos. San Carlos is a popular drive-to destination for people in the western United States and Canada. It’s as far south as you can go in western Mexico without having to get a vehicle permit. 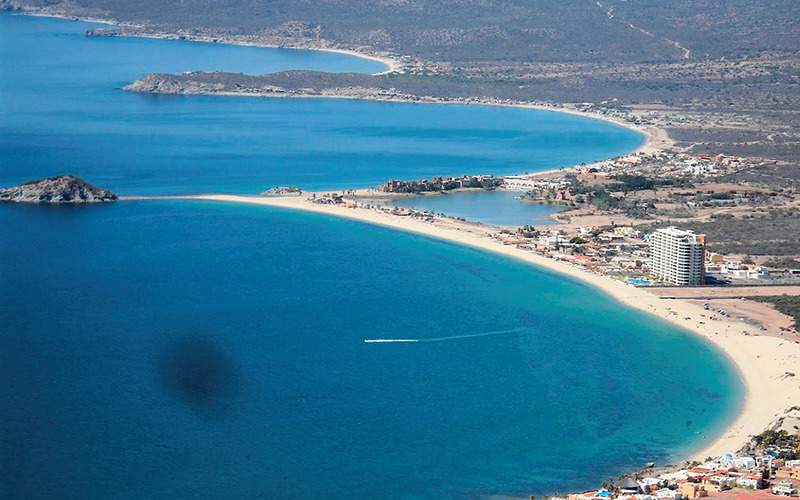 I first traveled to San Carlos from Álamos, on the recommendation of our realtor there who pointed out that some Álamos residents also own second homes in San Carlos. The city was born as a well-planned tourist destination in the mid-1950s… it had formerly been three large ranches. As such, you won’t find a colonial historic center in San Carlos… but you won’t find the poverty or run-down neighborhoods that you might expect in a real city either. The town has a positive, upbeat atmosphere, bolstered by the abundance of cheerful cafés, bars, shops, and restaurants. Most venues cater to the American and Canadian residents, so you’ll see plenty of burger joints along with a good selection of seafood restaurants. Sandy beaches highlight the entire area, bordering warm, calm waters. The city sits at the top of a giant cove, and the San Carlos coastline actually runs east and west, rather than north and south. In town, the 1.5 miles (2 kms) of beaches are mostly behind oceanfront homes and buildings. But as soon as you leave town heading down the coast, you’ll encounter over 3 miles (4.9 kms) of beautiful, uninterrupted beach. Heading north, it’s just as beautiful. San Carlos is a noted diving destination, with visibilities commonly in excess of 100 feet (31 meters) and sometimes over 200 feet (61 meters). It’s also a sportfishing destination and a good place for boaters, with two good marinas. Properties in San Carlos are a good deal. A modern beachfront condo will start at about US$200,000, for a two-bedroom, 1,400-square-foot (130-square-meter), on-the-sand building. The best deal I saw on a house was a two-bedroom, one-bath, 1,300-square-foot (120-square-meter) home just one “realtor block” in from the beach (234 meters actual distance). The asking price was only US$83,000. A nice beachfront house on a large lot (in the Bahia sector) will start at US$325,000. San Carlos is a planned city that came into being fairly recently. So you won’t have the feel of Mexican heritage that you see in most Mexican cities. You will however, see many homes in the colonial style. It’s an easy drive from the U.S. border, with no vehicle permit required. 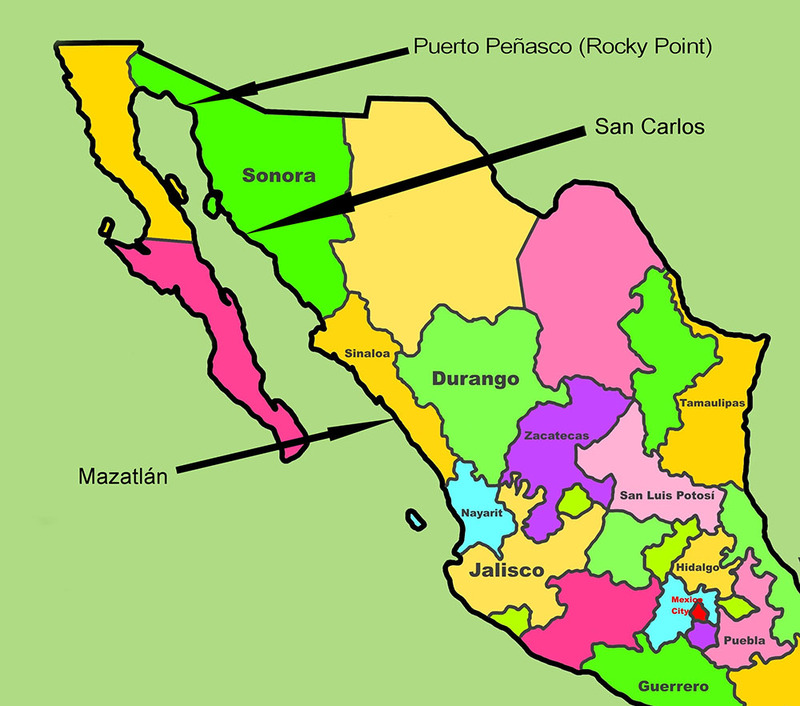 Like Puerto Peñasco, San Carlos lies in Sonora’s “free zone,” which also enjoys reduced customs requirements. It’s a noted diving location, with good diving facilities. San Carlos has two nice marinas with plenty of slips. It’s adjacent to a real city (Guaymas), with good services and commercial establishments. Drive time from U.S. border: 14 hours, 723 miles (1,165 kms). Four nonstop flights to the United States, and five to Canada. Mazatlán is a long-time, well-developed resort city, which sits on the Mexican coastal mainland opposite the tip of Baja California. It’s a fairly large city, in which the resort areas and historic center are along the coast… while the non-resort sectors—the seaport, tuna fleet, and industrial area—lie farther inland. As you can imagine, most expats and part-year residents live on or near the coast. 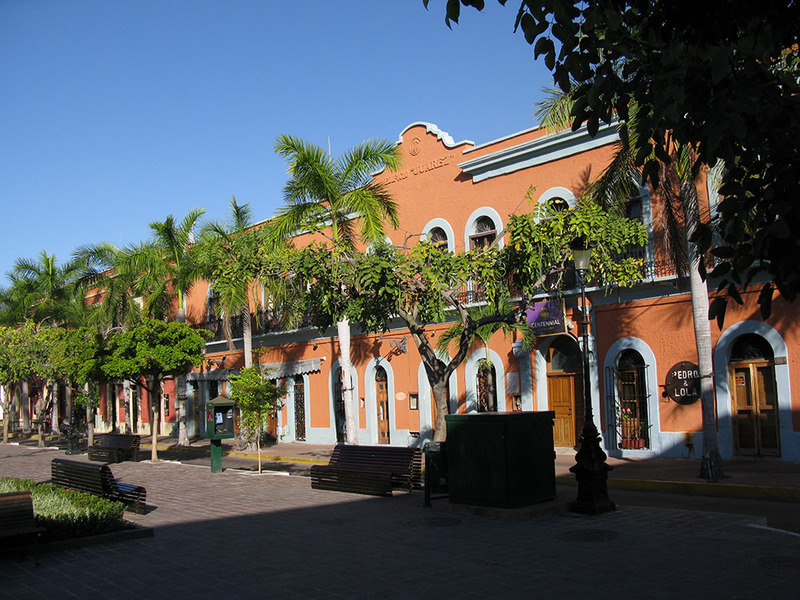 One thing that sets Mazatlán apart is that it has a large and well-maintained colonial historic center. In fact, as I write this, road crews are working seven days per week converting the paved roads in Centro back to cobblestones. They’re also widening the boardwalk, adding bike lanes, expanding many of the sidewalks, and improving the lighting. 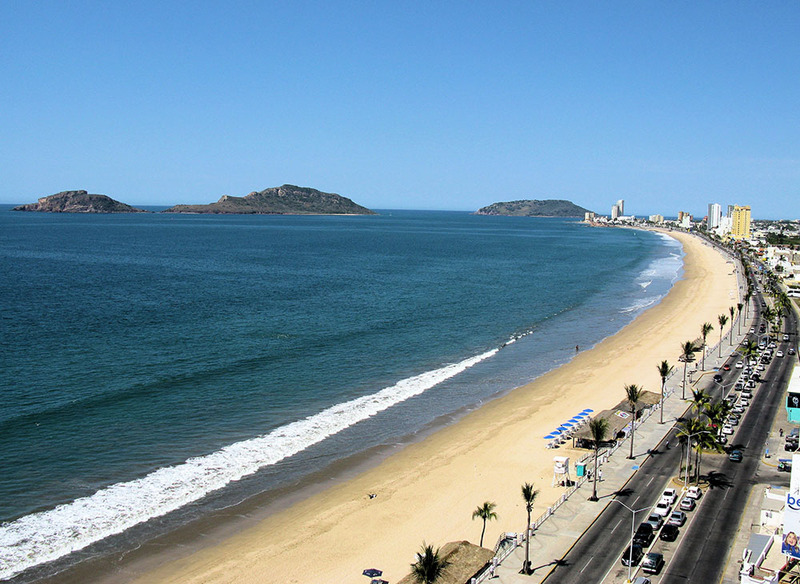 But what originally made Mazatlán famous were the beaches… about 20 miles (32 kms) of white sand, bordering clear, warm waters, with a boardwalk running adjacent to the beach for about 10 miles (16 kms). Since Mazatlán is a real city, you’ll also find a good offering of big city amenities… things like hospitals, theater, jazz, classical concerts, and fine dining, along with the waterfront seafood restaurants and beach scene. The city also offers several golf courses and a large marina district with good marine facilities as well as residential developments. Sportfishing is a big attraction in Mazatlán, with a good-sized fleet of boats to service the influx of anglers going for sailfish, wahoo, mahi mahi and yellowfin tuna, as well as the area’s record-setting marlin. Properties in Mazatlán vary from basic vacation construction to high-end luxury. A large, two-bedroom beachfront condo just north of the Golden Zone (away from the historic center) will start at about US$199,000. A waterfront home in the marina district will go for US$189,000, for a three-bedroom, 2,100-square-foot (192-square-meters) unit. The best luxury addresses on the water will sell two-bedroom, 2,100-square-foot units starting at about US$340,000. If you want a luxury seafront unit in the historic center, you’ll pay about US$350,000. If you’re driving, it’s at the limit of a one-day drive. I actually break it into two days when I go to the United States, while our younger family members do it in one. In the Golden Zone (the main tourist area), you’ll find plenty of touristy annoyances, such as tour guides and vendors. As a resident, you probably won’t spend much time there. Mazatlán is mostly a Mexican resort, and Mexicans are not known for their quiet partying… so it can get noisy downtown during weekends and holidays. It offers city amenities, such as theater, orchestra, and city-style shopping. You’ll find plenty of fine dining, cafés, and hole-in-the-wall bars to enjoy. Most of the beaches are directly accessible, without buildings blocking access. There are a variety of lifestyles to choose from: quiet or bustling… historic or modern… expat areas or those more popular with well-off Mexicans. Convenient flights make the trip to Phoenix in less than two hours. Is A Home On The Sea Of Cortez For You? Puerto Peñasco is perfect for those who want a convenient, short-term getaway. I think it’s best for the part-time or vacation homeowner, and from the western United States, it’s feasible to go for a long weekend. San Carlos is still within an easy drive of the United States, and offers more amenities to the expat or part-time resident. It’s also a better base of exploration, from which you can discover more of interior Mexico. Mazatlán is best for full-time or long-term living, offering the chance to combine colonial city living with a beachside lifestyle. The Sea of Cortez is calm, warm, sheltered, and close by. If you’re looking for an easy-access seaside home, there’s a good chance that one of these cities will be right for you. What are the requirements for getting a Mexican residency visa? I presently spend 180 days per year in Cancún. Mexico offers the easiest residency visa I’ve found. You can qualify on income… but unlike most countries, you can qualify on savings as well. According to the Mexican consulate in Phoenix, for a temporary residence visa, you need to show an income of US$1,300 per month or a savings balance of US$21,500 for the past 12 months. For a permanent residence visa, you’ll need US$2,200 per month or a savings balance of US$85,000 for the past 12 months. Mexico also offers options for property buyers, investors, or those people having a relationship with a Mexican citizen or resident. When I got my visa, I got the visa and was out the door within a half hour. I am considering the purchase of a condo in the Vista Encantada Eco Club. They were a presenter at the recent Retire Overseas Conference in Orlando. Can I deal directly with the developer or do I need a local attorney? You should get an independent attorney (not one recommended by the developer) before any money changes hands. This is not because I have reason to suspect anything is wrong… but having an attorney is a good practice, every time, no matter how honest you think the developer is. We bought a home in the small village of Ajijic, Mexico. It is an informal, quaint, colorful, and peaceful place, with many cultural activities, interesting and diverse people and a lovely relationship with the local Mexican families. It’s inexpensive, but if you want to spend money, it’s only a five-hour bus trip to the coast! There are modern stores as well traditional Mexican shops. We drive a golf cart at all hours, up and around the cobblestone streets. We enjoy great places to eat, concerts, and plays a few times a week. The weather is excellent (70s) most of the year…except in May it’s a wee bit hot! We feel safe and love that our kids and friends from the West Coast (Portland, Oregon) can visit easily. We have found many very interesting and meaningful volunteer projects, which three generations of our family work on. When we have needed medical help, the doctor often will offer to come to our home! To date we have gotten excellent dental and medical care. Our family highly recommends Ajijic to anyone who might be interested in an informal, stimulating, and relaxed life style on Lake Chapala (which we do not recommend swimming in but kayaking is great). Hope you will come visit… and our investment has increased greatly already. Ajijic and the Lake Chapala area are at the top of the list for expat venues in Mexico, and Nonnie gives a few good reasons why.